In troubleshooting, the problem symptoms must be confirmed accurately. Preconceptions should be discarded in order to give an accurate judgement. To clearly understand what the problem symptoms are, it is extremely important to ask the customer about the problem and the conditions at the time it occurred. As much information as possible should be gathered for the reference, even past problems that seem unrelated may help in some cases. 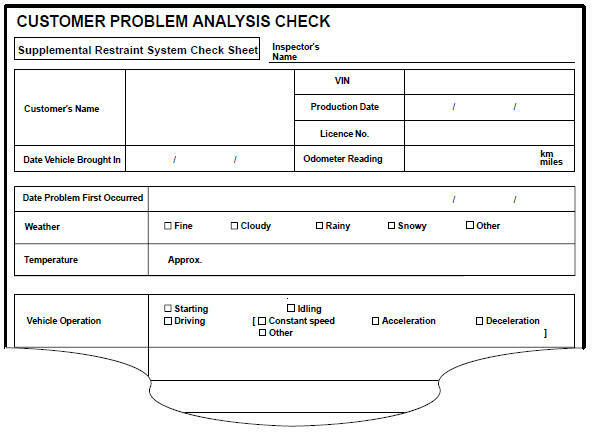 In the Diagnostic section, a customer problem analysis table is provided for each system. (Sample) Supplemental restraint system check sheet.